It’s been a while I have wanted to talk about posting during the social network downtime meaning: too early or too late in the day and Sundays ;-) Over time, I’ve seen friends/followers posting about promotions, products and/or services they offer on Sundays and I wondered if that had effective results. I came to understand that Sundays are the only days when they have the time to do their social media activities. 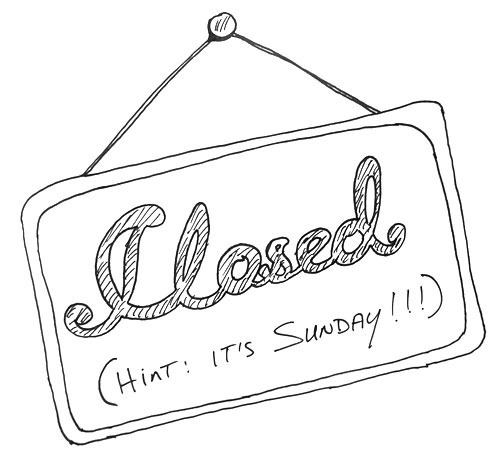 The down side is that the social network users are most likely not online on Sundays. Sundays have become the “computer off” day for a lot of people. Personally, I’ve noticed that my Facebook news feed is quite dead on Sundays. I instinctively learned that if I wanted to share something, I have to post about it on a week day and during hours that I know my friends/followers are online. I also consider in what time zone they are because I’m located in Europe. Although, Facebook allows you to sort your news feed, and your post might show up in your friends’ top news, there is a possibility that your post goes unseen. And Twitter is worse. If your followers are in a different time zone and following a lot of people, your news is guaranteed to go unseen. How effective is that? Too often still, people think that engaging in social media activities is something you do when you have time. It might be true when it is for personal use but not if you are seeking to reach people and promote your music / art. Social media activities are to be included in your schedule the same way as you schedule your other promotions, meetings, gigs, forecasts, etc. It’s part of your online marketing strategy. How relevant is that for artists, musicians and bands? Very! Know your fans – Who are they? Where are they located / timezone etc? Knowing this will help you to communicate more effectively and ensure what you have to say is heard. You want to announce gigs, new releases, give-away, send a reminder? You want to share thoughts, comments, other people’s information, pics and videos, etc? Then, you use your spontaneous posts by reposting them and reminding your fans about it.